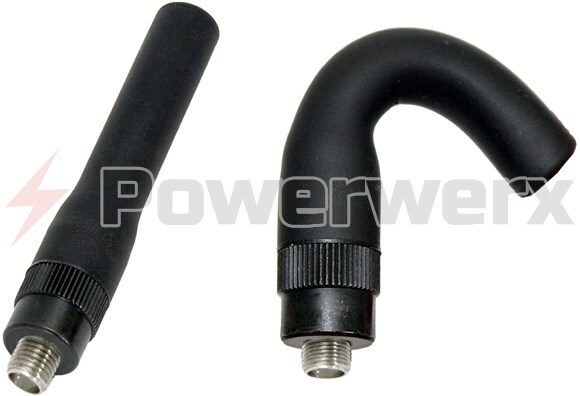 Powerwerx stubby dual band antenna. Wide receive range of 118-960 MHz. TX cut for commercial and amateur frequencies. Super flexible design. 3 inches long. 2:1 or less SWR. Reverse SMA fits TERA models TR-590, TR-500, TR-505 & Wouxun KG-UV3D. 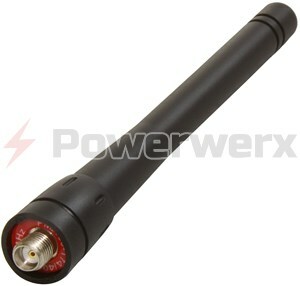 Powerwerx stubby dual band antenna. Wide receive range of 118-960 MHz. TX cut for commercial and amateur frequencies. Super flexible design. 3 inches long. 2:1 or less SWR. Reverse SMA fits TERA models TR-590, TR-500, TR-505 & Wouxun KG-UV3D. Using this on a Motorola APX 8000 for VHF/UHF. This is a great alternative to the cumbersome stock antenna if you are not transmitting on 7/800 or using the GPS function. Performance is surprisingly good on VHF and very impressive on UHF for both RX and TX. The antenna fits the reverse SMA connector well with no gap under the base.